I got into a fight with my friend the other day while we were cooking. I was apparently giving too much cooking “advice”. I gave so much advice that she stormed out of the kitchen and told me to finish the Mac and Cheese myself. I was wronged to tell her what to do. If I wanted to add my flair, I should have cooked. With each of my modifications, it slowly becomes my dish and no longer hers. “No Modifications, No Substitutions. 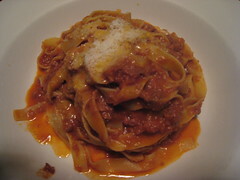 No reservations,” is Terroni’s model. It is the perfect model when it comes to eating someone’s cooking. You want to taste a chef’s flavor profile. Each creation should have been perfected before arriving on your table. Adding or removing ingredients could ruin the magic of the chef’s creation. Terroni, located on Beverly Blvd, north of the Grove, is a marriage of an old school diner and a modern, trendy LA restaurant. It is filled with a hodgepodge of decorations - modern wooden booths, old school leather orange bar chairs, beautiful lighting fixtures and cans and bottles of the kitchen ingredients against the wall. Ricchia - (arugola salad): simple salad with fresh mushroom parmigiano reggiano shavings a light lemon dressing. 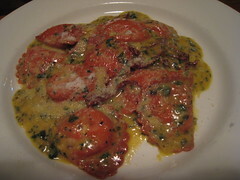 Ravioli di Burrata con Pesto Siciliano - Homemade Ravioli stuffed with creamy burrata cheese with tomato basil pesto and pieces of sun-dried tomato. 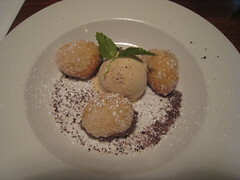 Fritters with Hazelnut Ice Cream - Round, soft, freshly fried doughnuts that are dipped in nutella and served with creamy Hazelnut ice cream. Terroni’s Southern Italian food needs no modifications or substitutions. It is perfect as is. This was not the most mind blowing Italian meal, but it was solid and well seasoned food that reminded me of my meals in Rome.